Above caption: The need for speed goes back to the beginning of America’s automotive history. Figures a Long Islander frustrated by our roads was the one to jumpstart it. 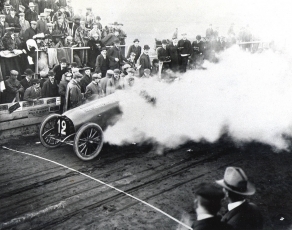 From 1904–1910, the Vanderbilt Cup Races were a popular pastime on Long Island that attracted as many as 250,000 spectators at once—an incredible feat considering few owned their own cars and traveling to Long Island was even more inconvenient than it is now. Considered “the Super Bowl of [its] day,” the races routinely appeared on “the front pages [of] all the newspapers,” said Howard Kroplick, North Hempstead Town Historian and owner of the Alco “Black Beast” racer, a two-time winner in the cups. William K. Vanderbilt Jr., great-grandson of business magnate Commodore Cornelius Vanderbilt, founded the races. As a member of the elite Vanderbilt family, “Willie K.” lived a luxurious lifestyle that included navigating yachts, racing automobiles and traveling abroad. Drawing from his experiences competing in the European racing circuit during the early 1900s, Vanderbilt discovered something alarming: Europeans were more progressive in assembling automobiles than their American competitors. Eager to surpass the mechanically savvy Old World, he strived to bring American technology up to speed. Vanderbilt’s mission might have been to build a better car, but it was also “about him having fun,” said Kroplick. At 26 years old, Vanderbilt proposed a competition that would challenge American car manufacturers to rival European counterparts. Enticing competitors from overseas, Vanderbilt sponsored the first international road race to be held in America and as its prize he donated the 30-pound silver “Vanderbilt Cup” designed by Tiffany & Company. 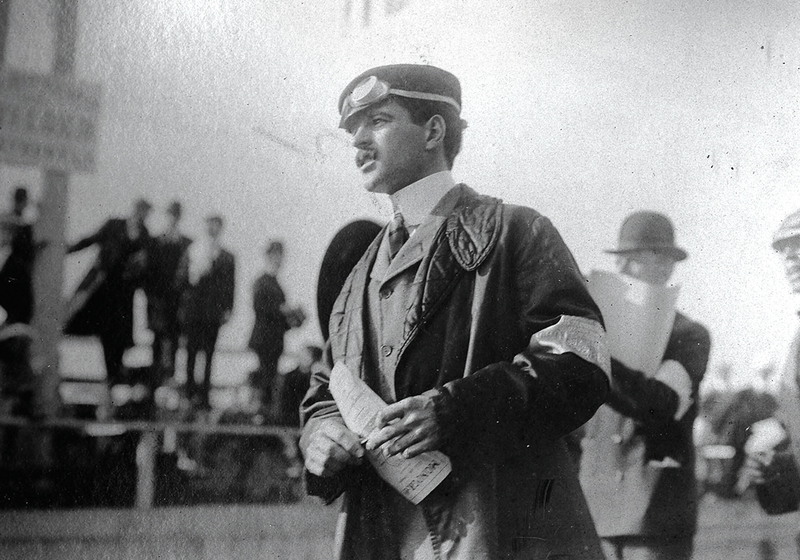 The inaugural William K. Vanderbilt Jr. Cup Race took place in Nassau County on October 8, 1904. Exciting and dangerous, motorists were drawn to the public dirt roads. However, when a spectator was struck and killed by a racecar in 1906, Vanderbilt decided that racing on public roads was too risky. His remedy was to create a safe, automobile-only private highway paved with concrete. The construction began between Westbury and Bethpage. But the building of Long Island Motor Parkway lagged due to complications in obtaining a right of way. Consequently, the 1907 race was cancelled. The right of way was finally acquired in 1908, permitting the parkway to stretch from Queens to Lake Ronkonkoma (about 50 miles). On June 6 of that year, an official groundbreaking ceremony was held in the town of “Central Park,” today’s Bethpage, inaugurating an approximately eight-mile segment of the thruway that would be integrated into the course. But a bittersweet revival followed in 1910 when tragedy resurfaced after two riding mechanics were killed and numerous observers were hurt. Harry Stone, the driver of a Columbia racer, was attempting to make a curve and lost control running off the Newbridge Avenue Bridge in East Meadow, striking and killing his mechanic Mathew Bacon. Another fatal accident followed when driver Louis Chevrolet’s wheel lodged into a rut, causing the steering mechanism of his Marquette-Buick to break. He crashed into a parked car in Hicksville and broke through a fence and tree. Charles Miller, Chevrolet’s riding mechanic, was pinned under the car, dying instantly. Chevrolet was thrown from the vehicle but survived. There were also injuries and fatalities to spectators and as a result, the competition was permanently shut down. Today, Kroplick preserves the history of these iconic races in his book, Vanderbilt Cup Races of Long Island, and also through various exhibits at Long Island museums. 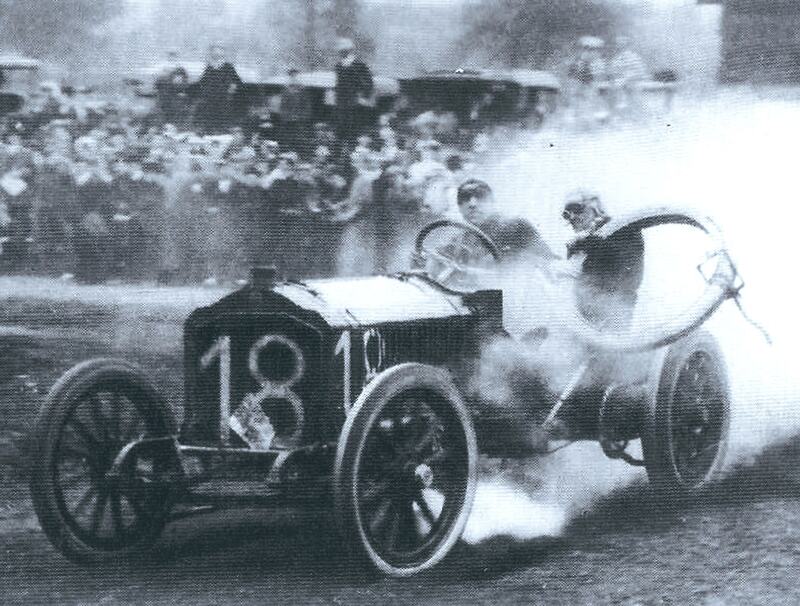 The #18 Lorraine-Dietrich at the Old Westbury Hairpin Turn during the 1906 Vanderbilt Cup Race.